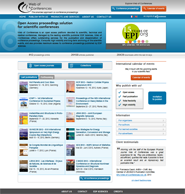 MATEC Web of Conferences is now indexed in the Chemical Abstracts Service (CAS). CAS monitors, indexes, and abstracts the world's chemistry-related literature and patents. It covers international journals, patents, patent families, technical reports, books, conference proceedings, and dissertations from all areas of chemistry, biochemistry, chemical engineering, and related sciences from 1907 to the present. Read more about RSS feed. To register for our free e-mail alert service, create your EDPS account and follow the link TOC Email Alerts.